Amitha obtained her B.Sc. from the University of Colombo (Sri Lanka), M.Sc. from the university of Victoria (B.C., Canada) and PhD in analytical chemistry from the University of Alberta (Canada). Following that, she held brief research positions at the Massey University (New Zealand) and NZ Leather Research Institute. She then held a research scientist position at the NZ Dairy Research Institute (NZDRI, currently Fonterra Research) for 4 years before moving to Australia in 1997. In Australia, she commenced her career as a lecturer in analytical chemistry at the University of Western Sydney, and then at Queensland University of Technology (QUT) until 2001. Following that, she held research positions in CSIRO (food science) and in QHSS (investigative chemistry) before joining the school of pharmacy in 2004. 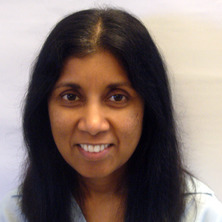 Please refer to the complete list of publications, in the link below, to get an idea of Dr Hewavitharana's research focus: https://akhcv.wordpress.com Stemming from PhD in analytical chemistry, Dr Hewavitharana's research is focused on solving fundamental analytical problems as well as developing analytical methods for a variety of applications such as: metal speciation (free/ionized calcium, and magnesium) and metabolite analysis (eg. pseudouridine, paracetamols, endorphins, dynorphins) in biological fluids, water and waste water, nutrients (eg. vitamins), antinutrients (eg. lysiniolanine) and antioxidants (eg. carotenes, tocopherols, tocotrienols) in dairy foods and meat products, nutraceuticals in tropical fruits (eg. carotenes, quercetins, mangiferin, anticancer compounds) psychoactive compunds (THC), marker compounds such as isoprostanes, sinistrin, fluconazole, pindolol, p-amino hippuric acid and creatinine, drug discovery (antibiotics and anti-cancer compounds from marine sponge bacteria and tropical fruit), drug delivery (dendrimers) and drug assay (BAY-11-7082, paracetamol, endorphin), Disease markers (eg. Sarcosine in prostate cancer), Fat and Water soluble analogues of vitamin D, Trace metals in food, Ion suppression effects in mass spectrometry, Challenges in method validation. Over the past 31 years, her research outcomes were achieved using a wide variety of instrumentation such as, HPLC -MS-MS, -PDA, -fluorescence, -EC etc, IC, GC-MS, HPCE, AAS, NIR, FTIR, FIA. Her interests also include method validation and laboratory quality assurance in line with ISO 17025. She provides her expertise as a technical assessor to NATA and IANZ, in ISO accreditation of food and water laboratories in Australia and New Zealand. LC-MS-Based Metabolomics Study of Marine Bacterial Secondary Metabolite and Antibiotic Production in Salinispora arenicola. Hewavitharana, Amitha K., Tan, Swee K. and Shaw, P. Nicholas (2014) Strategies for the detection and elimination of matrix effects in quantitative LC-MS analysis. LCGC North America, 32 1: 54-64. Bose, Utpal, Hodson, Mark P., Shaw, P. Nicholas, Fuerst, John A. and Hewavitharana, Amitha K. (2014) Two peptides, Cycloaspeptide A and Nazumamide A from a sponge associated marine Actinobacterium Salinispora sp. Natural Product Communications, 9 4: 545-546. Herath, H. M. D. R., Kim, R-R., Cabot, P. J., Shaw, P. N. and Hewavitharana, A. K. (2013) Inaccuracies in the quantification of peptides - A case study using beta-endorphin assay. LCGC Europe, 26 8: 435-437. Current status of Vitamin D assays: are they reliable and sufficiently informative for clinical studies? Herath, H. M. D. R., Kim, R. -R., Cabot, P. J., Shaw, P. N. and Hewavitharana, A. K. (2013) Inaccuracies in the quantification of peptides - a case study using beta-endorphin assay. LCGC North America, 31 1: 58-61. Matrix matching in liquid chromatography-mass spectrometry with stable isotope labelled internal standards - Is it necessary? Internal standard - friend or foe? Hewavitharana, A. K. and Van Brakel, A. S. (1998) A rapid saponification procedure for the simultaneous HPLC determination of the natural levels of vitamins A, E and beta-carotene in milk. Milchwissenschaft-Milk Science International, 53 1: 11-15. Wilkinson, J. and Hewavitharana, A. K. (1997) Lysinoalanine determination in sodium caseinate using the LKB Alpha Plus Amino Acid Analyser. Milchwissenschaft-Milk Science International, 52 8: 423-427. Hewavitharana, A. K. (1993) A Fast and Efficient Hplc Method for the Separation of Chromium Complexes in Chrome Tanning Solutions. Journal of the Society of Leather Technologists and Chemists, 77 5: 143-146. Nguyen, Thao, Parat, Marie-Odile, Hodson, Mark P., Shaw, P. Nicholas and Hewavitharana, Amitha K. (2014). Investigation of compounds with cytotoxic activity in Carica papaya leaves. In: 6th International Conference on Drug Discovery & Therapy: Abstracts. ICDDT 2014: 6th International Conference on Drug Discovery and Therapy, Dubai, United Arab Emirates, (126-126). February 2014. Asvadi, Naghmeh Hajarol, Morgan, Michael, Hewavitharana, Amitha, Shaw, P. Nicholas and Cabot, Peter J. (2013). Biotransformation within inflamed tissue of beta-endorphin 1-31 and three major N-terminal fragments; beta-endorphin 1-17, beta-endorphin 1-13, and beta-endorphin 1-11. In: 40th International Symposium on High Performance Liquid Phase Separations and Related Techniques: Delegate Handbook. HPLC 2013: 40th International Symposium on High Performance Liquid Phase Separations and Related Techniques, Hobart, TAS, Australia, (115-115). 18-21 November, 2013. Bose, Utpal, Hodson, Mark, Vidgen, M., Shaw, N., Fuerst, J. and Hewavitharana, A. (2013). Chemical diversity of marine bacteria Salinispora arenicola and "Salinispora pacifica" associated with the host sponges Dercitus xanthus and Cinahyrella australiensis. In: Abstracts: Ninth World Sponge Conference 2013. Abstracts for Oral, Speed Talk and Poster Presentations. The 9th International Sponge Conference, Fremantle, WA, Australia, (11-11). 2013. Bose, Utpal, Hodson, Mark P., Shaw, P. Nicholas, Fuerst, John A. and Hewavitharana, Amitha K. (2013). Discovering the hidden secondary metabolome of Salinispora arenicola: a study of intra-specific diversity. In: A. L. IL’ichev, R. T. Cardé, D. G. Williams and M. P. Zalucki, International Chemical Ecology Conference 2013: Program and Abstracts. ICEC 2013: International Chemical Ecology Conference, Melbourne, VIC, Australia, (). 19-23 August, 2013. Intraspecific variability in secondary metabolites of the Great Barrier Reef sponge-associated marine bacteria "Salinispora pacifica"
Bose, Utpal, Hodson, Mark P., Shaw, P. Nicholas, Fuerst, John A. and Hewavitharana, Amitha K. (2013). Intraspecific variability in secondary metabolites of the Great Barrier Reef sponge-associated marine bacteria "Salinispora pacifica". In: International Marine Biotechnology Conference, 10th Triennial Conference: IMBC 2013. Program and Abstract Handbook. IMBC 2013: 10th International Marine Biotechnology Conference, South Bank, QLD, Australia, (70-70). 11-15 November, 2013. Bose, U., Hewavitharana, A. K., Vidgen, M. E., Shaw, P. N., Fuerst, J. A. and Hodson, M. P. (2013). Liquid chromatography-mass spectrometry metabolomic profiling to explore inter-species diversity in the genus Salinispora. In: FEMS 2013: 5th Congress of European Microbiologists, Leipzig, Germany, (). 21-25 July, 2013. Bose, Utpal, Hodson, Mark P., Vidgen, Miranda E., Shaw, P. Nicholas, Fuerst, John A. and Hewavitharana, Amitha K. (2013). Patterns of chemical diversity on sponge associated marine bacteria. In: 9th Annual Conference of the Metabolomics Society: Full Abstracts. 9th Annual Conference of the Metabolomics Society, Glasgow, Scotland, U.K., (264-264). 1-4 July, 2013. Hewavitharana, Amitha K. (2012). Dependence of secondary metabolite profiles of Salinispora species on their geographical distribution. In: 16th International Congress (PHYTOPHARM 2012), St Petersburg, Russia, (). 9-11 July 2012. Bose, Utpal, Vidgen, Miranda, Shaw, Nick, Fuerst, John A. and Hewavitharana, Amitha (2011). Application of HPLC_QTOF-MS/MS to assess the chemical diversity of the marine actinobacterial genus Salinispora. In: Australian Pharmaceutical Science Association Conference, Adelaide, Australia, (). 2011. Ng,Yi Kai, Hewavitharana, Amitha, Shaw, Paul N., Webb, Richard, Hooper, John and Fuerst, John A. (2011). Developmental cycle and antibiotic production of Salinispora arenicola isolated from Great Barrier Reef Marine sponges. In: Society for General Microbiology Autumn Conference 2011. Society for General Microbiology Autumn Conference 2011, York, United Kingdom, (). 5-7 September 2011. Mutalik, Srinivas, Parekh, Harendra S., Hewavitharana, Amitha K., Shaw, P. Nick, Anissimov, Yuri G. and Roberts, Michael S. (2008). Development and validation of RP-HPLC method for quantification of peptide dendrimers in skin permeation experiments. In: Australian Pharmaceutical Science Association Conference 2008, Canberra, ACT, Australia, (). 6-9 December 2008. Hewavitharana, A, Shaw, P N, Kim, T. K. and Fuerst, J A (2006). Assessment of the presence of Rifamycin antibiotics in marine sponge bacterium Salinispora using LC-MS-MS. In: INTERACT 2006 : air, water & earth : INTERACT in Perth : program and abstracts. INTERACT 2006: Air, Water and Earth: INTERACT in Perth, Perth, Australia, (253-253). 24-28 September 2006. Lee, S, Dawson, P A, Hewavitharana, A, Shaw, P N and Markovich, D (2006). Increased acetaminophen hepatotoxicity in the NaS1 and Sat1 sulfate transporter null mice. In: Proceedings of the Australian Physiological Society: AuPS/Combio2006 abstracts. ComBio2006, Brisbane / Brisbane Convention Centre, (1-1). 24-28 September 2006. Shaw, P N, Hewavitharana, A, Lee, S, Dawson, P A and Markovich, D (2006). Profiling acetaminophen metabolites in mouse urine by LC-MS-MS. In: David Jones, Journal of Pharmacy and Pharmacology: Science Proceedings 2006. British Pharmaceutical Conference, Manchester UK / Mancester International Convention Centre, (A35-A36). 4-6 September 2006. Hewavitharana, A., Shaw, N., Hyde, C. and Thomas, R. (2005). Effect of drug-protein interactions on drug assay. In: E. A. Davis and C. G. Sobey, Program & Abstracts: Joint Meeting of ASCEPT and APSA 2005. Joint Meeting of ASCEPT and APSA, Melbourne, Australia, (2-39). 4-7 December 2005. Hewavitharana, A. and Shaw, N. (2005). Manipulation of the population of non-covalently bound species formed in the electrospray interface of LC-MS. In: S. Walker, Australian & New Zealand Society for Mass Spectrometry - 20th Conference Program & Abstracts Book. Australian & New Zealand Society for Mass Spectrometry - 20th Conference, Adelaide, Australia, (87). 30 Jan. - 3 Feb. 2005. Hewavitharana, A. K., Christensen, E., Golding, G. and Scheelings, P. (2004). A Feasibility Study of Fingerprinting Alcoholic Spirits Using SPME-GC-MS. In: Science - a smart state to be in. Interact 2004, Gold Coast, Queensland, Australia, (). 4-8 July 2004. Hewavitharana, A. K., Lanari, M.C. and Becu, C. U. (2003). Analysis of chicken meat for the influence of diet on tocopherol and tocotrienol compositions. In: Ethnics and meat technology : 49th International Congress of Meat Science and Technology : 49th ICoMST 2003, Brazil : 2nd Brazilian Congress of Meat Science: Proceedings. 49th International Congress of Meat Science and Technology, Sao Paulo, Brazil, (). 31st August - 5th September 2003. Note for students: Dr Amitha Hewavitharana is not currently available to take on new students. Genetic and chemical diversity of the actinobacterial genus Salinispora isolated from Great Barrier Reef sponges.